The way Patrick Rodgers sees it, he has two primary locations for his business, which includes promoting Gothic and neo-medieval music, and selling collectible trading cards for a fantasy game called Magic: The Gathering. One is on Fourth Street in Queen Village, where he has a landlord, a lease, and basic due-process rights for his Digital Ferret shop - including that his landlord can't just board up the store or summarily evict him. The other is online at eBay, where he owns a store called the MTG Place - and where, Rodgers complains, the Internet-marketplace giant maintains an almost neo-medieval level of control. For 46 days this winter and spring, Rodgers says, eBay essentially boarded up the MTG Place after accusing him of a "high volume of bad buyer experiences." His $20,000 of merchandise vanished from the site as if he were never in business there at all. Finally, eBay reversed itself, with an e-mail apologizing for "the inconvenience," but only after more than 30 frantic calls, e-mails and letters. Now, Rodgers is going up against Goliath: He sued eBay in Philadelphia Municipal Court, seeking $5,000 to compensate for 46 days of lost sales. His argument? Rodgers contends that eBay makes high-handed use of a broad "Abusing eBay" clause in its service terms. Like many other online companies, eBay offers services such as auctions and its online marketplace - in essence, a virtual mall - on a take-it-or-leave-it basis, outlined in its "User Agreement." But eBay isn't an ordinary online business. For some who sell there, eBay revenues are a primary livelihood. And they're equally crucial to the Internet pioneer, which earned $2.6 billion last year on $14.1 billion in revenue - more than half from its "marketplaces" segment, according to its SEC filings. Rodgers says he was indefinitely banished under terms that say eBay can shut down and remove any merchant "if we think that they are creating problems," with no clear right to a hearing or appeal. He says he reversed eBay's decision by eventually proving that it was all a case of mistaken identity. Rodgers says recent complaints had been lodged against another eBay merchant who sold him the MTG Place three years ago - copies of the $11,000 cashier's check and his bank records helped prove the point. EBay hasn't responded to my request for comment, but likely sees these disputes as nuisances. Last week, before Rodgers' court hearing was postponed, he says, an eBay attorney offered Rodgers $2,500 to settle the case. Before you count him out, a reminder about Rodgers: He may look like your ordinary Goth music promoter, but he's played David vs. Goliath before - even if he doesn't quite look the biblical part. Two years ago, Rodgers filed a suit against Wells Fargo in a mortgage dispute and won a $1,000 default judgment. 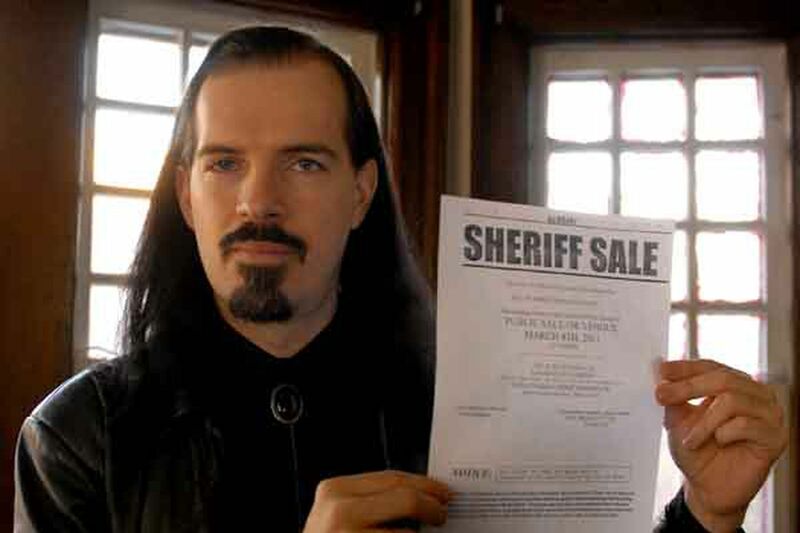 The poster announcing a "Sheriff Sale" for the contents of a Wells Fargo office, and Rodgers' claim that he had "foreclosed on a bank," made his tale go viral after I first told it here. Rodgers even made it onto Comedy Central's Colbert Report, for a segment the satiric commentator calls "difference makers." But Colbert couldn't ignore what others in the media downplayed or overlooked: a smile punctuated by four cosmetically enhanced teeth. "Wait, does he have fangs?" Colbert interjects (you can see the segment at http://bit.ly/113dLet) before asking why other newspeople were calling Rodgers "a folk hero" while overlooking that detail. "He's not a difference maker - he's a vampire!" Rodgers hasn't dropped the vampire shtick - it's useful when you're trying to stay young and edgy for the crowds he draws for shows such as his quarterly "Dracula's Ball." But in person, the only thing deadly about him is that he's deadly serious in demanding his rights. Rodgers is hardly alone in portraying eBay as high-handed. Dan Elman, a Drexel alumnus who sells Star Wars memorabilia and antique furniture at an online store he calls Kitsch-n-Kaboodle, says he quit eBay after 10 years because of a mishandled payment dispute. Elman says he was promised a response to an appeal within 72 hours. Two and a half months later, he was still waiting. "I never received any more communication from them," says Elman. The Web is a brave new world, both for consumers and merchants. Once again, the faux vampire has struck a real vein. Contact Jeff Gelles at jgelles@phillynews.com, 215-854-2776, or @jeffgelles. Read his blog at www.inquirer.com/inquiringconsumer.